Last week we had a tough even battle – the stuff of legends – against a top ranked team, so close it made the 2-1 loss even more infuriating. It showed us that despite our location on the ladder, we really are a good team who can challenge the top teams. We had a Tuesday midweek game over at Shenton this week and it was almost as if history was repeating itself. Some superb dominance from Zeus at the front saw him rewarded with the first goal on the scoreboard. However with exactly one minute to go till half time, YMCC just like our opposition from the previous week, came back with a goal of their own to even it all up at 1 all at half time. The thing with losing the lead just before half time means that we’re in the change rooms sitting there frustrated and disheartened, whereas our opposition is now pumped with a renewed sense of “we can do this guys – let’s win”. The second half saw some great performances from TC our Mug winner and our captain Domby and we had some opportunities in the form of 3 shorts and some field goal attempts however it was YMCC who converted their short with 20 minutes to go who would eventually come away as victors. Special mention goes to Lachy for being yellow carded for trying to pick on the female umpire – shame on you. She would have none of that. A close game and a disappointing result. It was the our second match for the week, and our second last one of the season. Sitting in ninth, it was essential that we secured a victory against the 11th ranked team namely Subs. This looked promising in the first half with Viner slotting in a field goal ten minutes into the match. We were the stronger team and this should have been an easy one for us to win. Despite us knowing that our weakness is letting in a goal just before halftime, we STILL managed to let one in against us 5 minutes before half time. 3rd match in a row we’ve let the other team equalise just before half time. Once again 1-1 at half time. Ten minutes in, once again a goal was scored, but this time by Subs. 2-1 down and the bench was starting to get angsty. It took not 1, not 2, not 3 but 4 short corner attempts for us to finally convert a goal and it was a Squibb push to the bottom right corner. Sub’s goalkeeper was the same one as for the 1’s match and he really was having an amazing day.Matty Sweetman on our side was having a blinder and got nicely rewarded with the mug for the game. We managed to hold out against two of Subs’ corner attempts and then Lachy got sent off with a yellow card, his second one this week to put us a man down with ten minutes to go. This was just the edge that Subs needed and they scored a breakaway field goal while we were a man down with 6 minutes to go. Our trapping was poor, our marking was a little bit average and our communication needed a lot of improvement. It was these basics which saw us throw away the match in the second half to see the final score at 3-2 against us. Apparently I’ve been suffering from this for a decade now, ever since I got thrown over a cliff by a horse on family holidays in the Drakensberg Mountains. 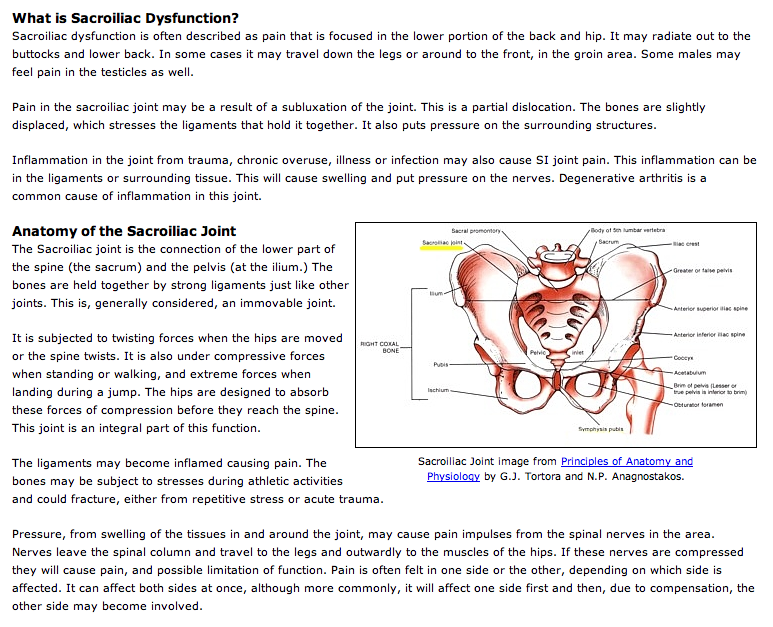 My snowboarding injury in Japan a few weeks ago has made my condition severely worse. I’m getting an MRI tomorrow – slightly petrified as I am claustrophobic, to ensure nothing is broken and that nothing more is damaged. 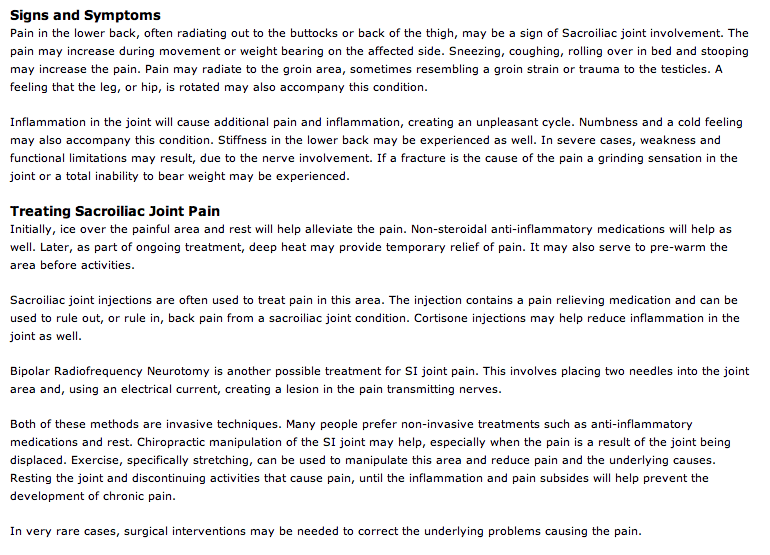 Looks like my treatment will be the invasive injections filled with cortisone for 12 – 18months. It’s kinda cool when you come across old articles on the internet which show how much of a difference you’ve actually made in the world. Back in 2000, when I moved to Qatar – I was devastated to find out there was no hockey at all. It was my favourite sport, and I’ve been playing representative since I was 12, and Premier Women’s League since I was 15. So as a determined school girl, I rented out the sand astro to hold training sessions with whoever I could round up (my friends mostly… even though a lot of them had never played before, and just enjoyed getting violent with sticks). This expanded and it eventually became a club. With the support of my dad (I needed an adult at times), we appraoched the expatriate pakistani and indian men and requested some matches.. This saw them forming their own clubs, and the desire for a league came into being. However facilities were scarce and no sports stores selling equipment was difficult. We had to import everything. I unfortunately then had to leave to start a career in Australia, however my father took my place and proudly sit on the Qatar Olympic Committee (Hockey). Love your work dad! Qatar now has more than one hockey stadiums/turfs in Qatar, a hockey academy, a league and some decent clubs. Here is one of the articles..
QATAR Olympic Committee (QOC) has decided to render long-term support in developing field hockey in Qatar. A committee has been formed and plans have been chalked out for the 2008-2009 season. Hockey, which is mainly followed by the expatriate population, will have their own league and an academy to nurture young talent. This was announced during a media briefing by Sheikh Saoud bin Abdulrahman al-Thani, QOC secretary-general. “Hockey is one of the popular sports among the expatriate population in Qatar and we are more than happy to render our support to them,” said Sheikh Saoud. “HH the Emir Sheikh Hamad bin Khalifa al-Thani and HH the Heir Apparent Sheikh Tamim bin Hamad al-Thani has asked us to get hockey in our fold after seeing the overwhelming enthusiasm and interest among the expatriates during the Asian Games,” added Sheikh Saoud. The Qatar Hockey round-robin league will be played in two rounds commencing from January 11, 2008 and it will feature the four already existing clubs — Wanderers Hockey Club, Doha Hockey Club, Pak Hockey Club and Gateway Hockey Club — vying for top honours. A knock-out tournament will also feature in the 2008-09 calendar. The league will take place at the Al Rayyan Stadium, where the 2006 Doha Asian Games hockey matches were held and the stadium will be soon undergoing some renovation to incorporate change rooms. The academy is scheduled to be launched by December 14 and selected children between the age group of 8-14 will be given extensive coaching. The school authorities have been assigned with the selection process. Shuttle services will be provided for the selected boys for the practice that will be held between 3.30pm and 7.00pm on Fridays. “Already many Indian, Pakistani and Western schools practice hockey and they will be more than happy to know about this development. We are expecting a good response in the coming days,” felt president Hasan al-Qadi. An India versus Pakistan friendly match is also planned in the month of March and April to boost this cause. “We have been having talks with both Indian and Pakistani hockey federations in this regard and will be finalising things soon. I am sure the response to this match will be phenomenal,” asserted secretary Mohd Abdul Nazer. If everything goes as per the plan, QOC will also try to get affiliation with the International Hockey Federation. “We will see how things will shape up in the coming months and maybe in the future we will try and get hockey if not as a federation but as a club registered with the International and Asian Hockey Federation. I am sure they will be more than happy to get us into their fold,” notified Sheikh Saoud. “We want this organisation to be a profit making one and will try to rope in sponsors and host maybe a Qatar hockey championship where teams can come and participate for a handsome reward every year. However, all this will shape up in the coming years, this is just a beginning,” added Sheikh Saoud. The following are the committee members: Hasan al-Qadi (president), Easa al-Harami (QOC representative), Mohd Abdul Nazer (secretary), Tariq W. Kureishy (member), Neville Gibbs Jones (technical co-ordinator). Teams: Wanderers Hockey Club, Doha Hockey Club, Pak Hockey Club, Gateway Hockey Club. So, I’m currently captaining a summer league mixed hockey team at the Perth Hockey Stadium for the months of October, November and December (possibly Jan through to March too). Our team name is TEAM VUVU, as our regular club teams are notorious for our vuvuzela usage in regular winter season. Polos were expensive to print, and were gonna cost over 40 dollars each to have them double sided, so I decided to try my hand at screen printed. Here is the result… shirts ended up costing 20 bucks to make. MUCH cheaper:) And they look pretty good for a first time effort! 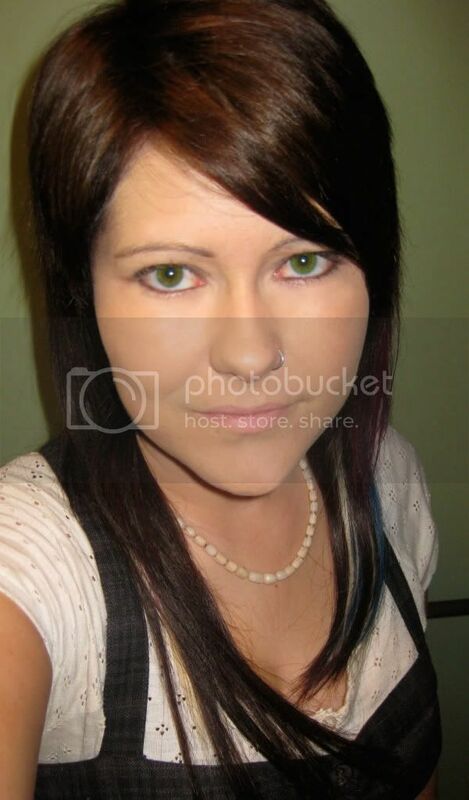 I’ve replaced it with something of a powder blue nature. 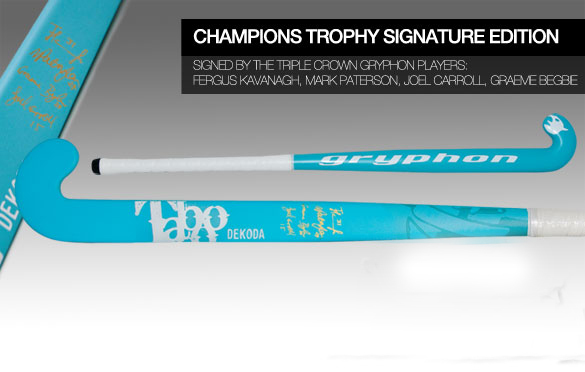 Gryphon Taboo Dekoda – retails for $450..
With signaures from 4 of the Aussies who took home the Championship Trophy. Can’t wait to play it on the turf.